We are a quality oriented company, and thus strive to ensure highest standards in the production as well as procurement process. To ascertain flawless production of our range of Bed Head, Ceiling Pendant, etc., we undertake number of stringent measures. Our well experienced quality controllers keep a close vigil on all the activities including designing, fabrication, packaging, and others. In addition, we also pay extensive attention while procuring the products from vendors. Our sourcing agents carefully inspect the products at vendors' premises, before procuring them. Owing to our strong commitment towards quality, we have acquired tremendous success in the domain. 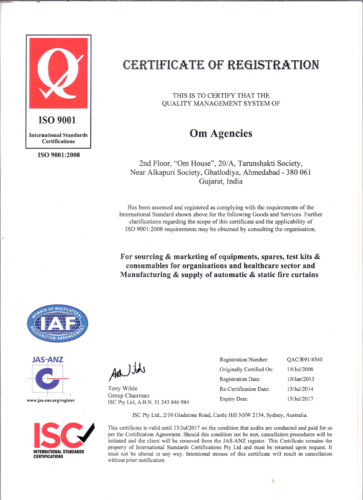 One of our group companies 'Om Agencies' has acquired the ISO 9001:2008 certification for sourcing & marketing of Equipment, Spares, Test Kits, and Consumables for healthcare segment. For the same business activities, our other wing 'Om Hospi-Equip and Services Pvt. Ltd.' has also got the ISO 9001:2008 certification. Moreover, our flagship company 'Om Services' has fetched the ISO 9001:2008 certificate for providing services for installation, commissioning, maintenance, repair of healthcare equipment.